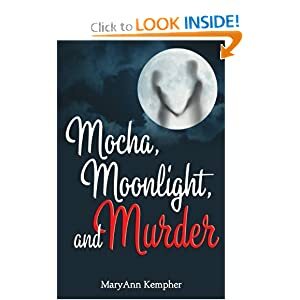 MaryAnn Kempher moved to Reno NV, where Mocha, Moonlight, and Murder is set when she was 15. She currently lives in Florida with her husband and two children, two dogs and one cat. Her favorite authors are Jane Austen and Agatha Christie. Her guilty pleasures include any and all sweets; cake, cookies, brownies, and of course a grande Café Mocha. I’ve always loved to write, but it wasn’t until about four years ago that I decided to try writing a book. My children are my inspiration. I want to show them that they can make their dreams come true. I’m definately not an outliner. I’d love to be, I suspect it would make my writing life a lot easier. I pretty much just sit down in front of the computer and start writing. I make it sound easy, don’t I? The truth is I sometimes sit for a long time before ever actually typing. Sometimes the words come easy, sometimes they don’t. I always find that question funny, and I get it a lot. No, I don’t talk to my characters, and they don’t talk to me either. They do become very real to me though, and as I write their dialogue I know whether (if they were real people) they’d say the line or not. I’d tell someone just starting out that before they start writing they should go buy some really good self-help books in the genre they want to write in. For some reason, people sometimes think that if a creative person seeks advice or help, somehow that reflects badly on them. If you were new to anything else, you’d ask for advice on the best way to start–why is writing any different? I’ve listed some really good self-help books at my website. A friend of mine had just had her book published. Her publisher was closed to submissions except with a referral. She read my book, referred it, and her publisher is now my publisher. My publisher is a hybrid, not self-publishing but not traditional either. I’d advise all writers to get their books professionally edited and proofread before sending to anyone. No exceptions. I don’t know. I hope there’s room for everyone. I don’t want to see bookstores closed. But they charge so much money for their books, it’s not surprising that more people are buying on-line where books are so much cheaper.